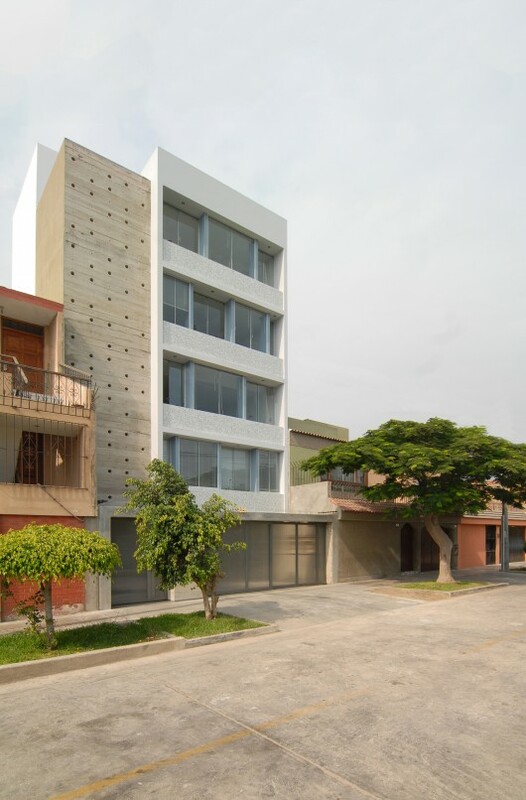 From architects Oscar Malaspina, Rodrigo Apolaya, and Rosa Aguirre via Arch Daily "The city of Lima is experiencing a real estate boom. In the past two years, approximately 40,000 dwellings have been sold. The speed of these changes and the high demand for social housing has resulted in projects that focus more on profitability than improving people’s lives through the re-imagination and quality of the spaces. "The MQ project, a 4-apartment building in a 8 m wide and 20 m long parcel, explores these ideas and takes on the challenge of promoting a sense of community within the building. The main strategy was the articulation of a series of open spaces and rooms along a main corridor that serves as a space itself. This pattern allows both the expansion of visual perception through diagonals across open spaces, and the presence of natural light and ventilation in every room of the project. "The facade of the building tries to be clear in defining the two functions that are represented. In the area of the flats we have proposed a thick facade that brings enough depth to host window boxes in the outside. In the area of the vertical circulation, we entirely close it and play with the cast grid during the construction process." Full post with many images here.